UNION LAKE, Mich. – (October 3, 2018) – Adrian College, the defending Men’s Division I National Champions of the American Collegiate Hockey Association, received 34 out of 35 first-place votes to come in as this year’s pick for the top spot in the 2018-2019 ACHA Men’s Division I Ranking, No. 1. 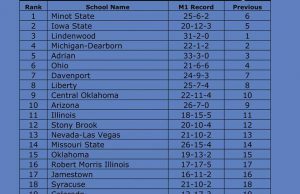 Second-ranked Minot State University received the other first place vote, while the University of Illinois, Lindenwood University, and Ohio University rounded out the Top 5, respectively. 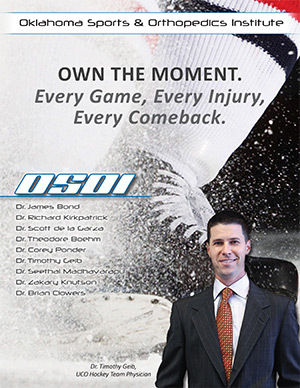 The Eastern States Collegiate Hockey League (6) and the Central States Collegiate Hockey League (5) lead the way with all of its member teams ranked, while the Western Collegiate Hockey League has six (of 8) of its member teams ranked, and the Great Lakes Collegiate Hockey League has three (of 8) of its member teams ranked. 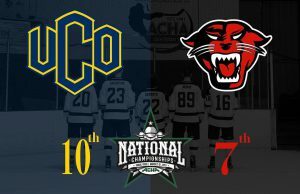 Over the past 16 seasons, 12 different schools have won the ACHA Men’s Division I National Championship: Lindenwood (3), Central Oklahoma (2), Illinois (2), Adrian, Arizona State, Davenport, Delaware, Minot State, Oakland, Ohio, Penn State, and Rhode Island. 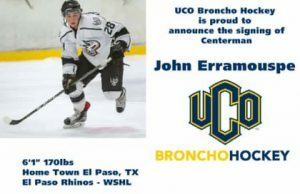 A total of 60 teams will compete in Men’s Division I this season, including two new teams: the University of Toledo and William Paterson University. The two teams departing Men’s Division I include Midland University and Saint Bonaventure University. The second ranking of the regular season will be released on Wednesday, October 10, 2018. The 2019 ACHA Men’s Division INational Championships will be hosted March 21-26 for the first time by the Dallas Sports Commission, Dallas Stars, and Dr Pepper StarCenters at the Dr Pepper Arena, in Frisco, TX. This will be the eighth year of the 20-team format.